Blue cornmeal is not a necessity for this recipe. It is harder to find and more of an investment than the regular kind. You can definitely use yellow cornmeal as a substitution and the muffins will still taste the same. You can use low-fat yogurt in this recipe, but not non-fat because the muffins will not turn out as moist. You can also substitute sour cream for the yogurt. If you are using frozen blackberries, do not defrost them before adding them to the batter. Defrosted berries will stain the batter. If you don’t have blackberries, you can use blueberries or raspberries instead. 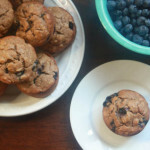 These muffins will keep, tightly wrapped at room temperature for 3-4 days. They can be frozen for 2 weeks. Wrap them in foil and put them directly into a 350F degree oven from the freezer for 10 minutes to reheat. Preheat the oven to 375F degrees. Grease two standard muffin tins with nonstick cooking spray. Whisk the dry ingredients in a large bowl to blend. In a medium bowl, stir together all of the wet ingredients except the berries. Using a rubber spatula, fold the wet ingredients into the dry ingredients until just mixed. Fold in the blackberries. Fill the muffin cups about 2/3 full and bake for 18-20 minutes or until a tester inserted into the center of a muffin comes out clean. Let muffins cool in the pan for about 5 minutes and then transfer to a rack to cool some more. Serve warm or at room temperature.